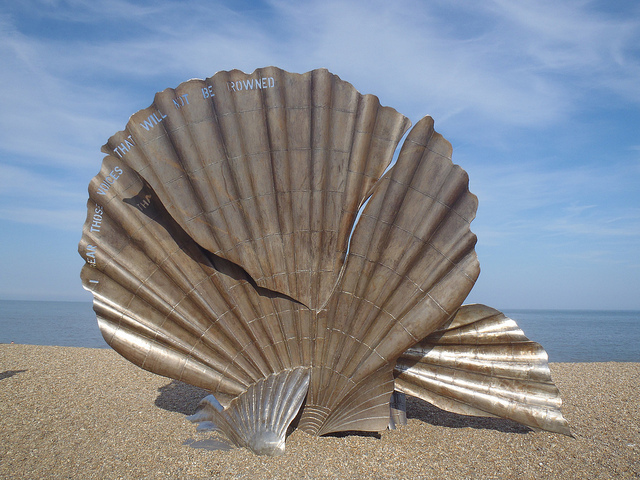 A tribute to Aldeburgh's most famous resident, Benjamin Britten, Scallop stands on the beach between the town and Thorpeness to the north, and was unveiled in 2003, designed by local artist Maggi Hambling, initially to some scepticism, but seemingly popular with visitors and walking locals when your author dropped by last week. The sculpture rises 15ft high from the shingle and features six and a half tonnes of interlocking stainless steel scallop shells, featuring the words "I hear those voices that will not be drowned" from Britten's opera Peter Grimes. This is such a brilliant blog.